What does a new dad really need this Father’s Day? Some peace and quiet from the nonstop crying? Never gonna happen. A brand new shirt to replace the burp stains? Boring! Enter Baggino, what Dad really needs this Father’s Day, and the best part is it is almost as neat as his new tot. Invented for Dads by a Dad, Baggino is the newest diaper bag on the market that combines style and function. Not your typical diaper bag, this is a one-of-a-kind 3-in-1 Combination Diaper Bag-N-Changing Belt that conveniently converts into a hands-free baby changing waist belt that looks just like a tool belt. 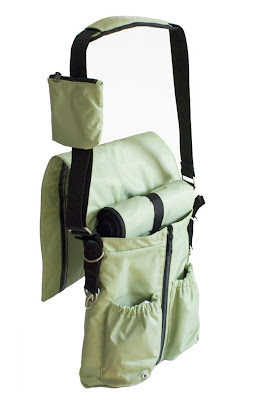 It solves the problem of having to put diaper bags on unsanitary surfaces, floors or cramped spaces. Colors Available: Classic Black, Lime Green and Classic Black with Lime Green Flap $129.00 at www.Baggino.com. The best part about Baggino is that Dad can be “Mr. Mom” sporting the diaper bag while still maintaining his manly image, as is doubles as a messenger bag. LeatherandBags.com has some great diaper bags for dads in messenger, backpacks and satchels from DadGear, Fleurville and Kalencom on sale. These are great fashionable and functional bags so dads can still look hip and cool!